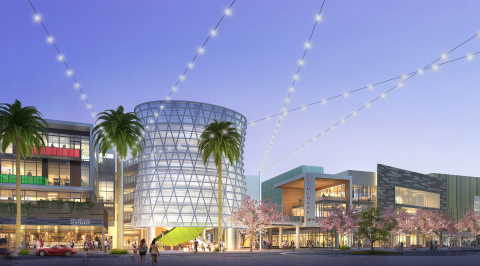 PLAYA VISTA, Calif.--(BUSINESS WIRE)--Runway at Playa Vista announced the addition of eight new tenants to the growing list of retailers that have signed leases to be part of the new mixed-use lifestyle center being constructed in the heart of the Playa Vista community. The Studio MDR will bring its unique brand of fitness to Runway along with several new restaurants, including 800 Degrees, Urban Plates, ROC Kitchen, and N’Ice Cream. Starbucks, 18/8 Fine Men’s Salons and Varnish Lab nail salon have also signed leases. The announcement of the new leases was made by Runway’s development team, including Lincoln Property, Phoenix Property Company and Paragon Commercial Group. These new tenants will join several top brands that are already part of the Runway line-up, including restaurants Lyfe Kitchen, Panini Café, Hopdoddy Burger Bar and Sol Cocina. Prominent retailer Whole Foods is planning to open its new store early next year. Cinemark’s NextGen nine-screen multiplex with RealD 3D capability, self‐serve concession stands, and an open plaza with a cocktail lounge is expected to have its premiere in November of this year. Chase Bank, Wells Fargo Bank, and CVS Pharmacy will also be part of Runway. Playa Vista and the surrounding area, recently dubbed the "lower Westside" and "Silicon Beach 2.0," is a growing technology and entertainment hub home to many prominent creative and socially engaging companies including Facebook, YouTube, Konami, Electronic Arts, Microsoft, Fox Sports, Belkin and TMZ, as well as leading ad agencies 72andSunny, Chiat/Day and Deutsch, socially conscious manufacturers like TOMS Shoes, and Hercules Studio—the film stage for Avatar and Iron Man 3. The community, already home to more than 7,000 residents, also features beautiful neighborhood parks, a variety of new for-sale and apartment homes, a K-5 public school, city library and many more amenities. Introducing new residential, commercial, retail, and open space only 1.5 miles from the Pacific Ocean, Runway at Playa Vista is a welcoming spot to live, work, shop and play. The location puts Runway within easy reach of LAX as well as the 250,000 residents of Manhattan Beach, Westchester, Marina del Rey, Santa Monica, Venice and Culver City. Construction is anticipated to be completed in early 2015, with many tenants opening their doors before the holiday shopping season in 2014. When complete, Runway at Playa Vista will include over 220,000 square feet of retail, 420 residential units, and 30,000 square feet of office space spread across eleven acres. The retail complex, designed by Johnson Fain, will feature wide sidewalks for outdoor dining, soothing water features, communal seating areas, fire pits and a direct connection Playa Vista’s Linear Park. A lantern‐shaped tower with a steel mesh exterior and dramatic lighting will house a central lanai lounge that anchors the center and serves as Runway’s central meeting place. CBRE is the leasing broker for Runway. Retailers interested in Runway should contact Zachary Card, CBRE Retail Services, at 310-550-2542. Lincoln Property Company, founded in 1965 by its chairman Mack Pogue, is a privately‐owned real estate firm involved in real estate investment, development, property management and leasing worldwide. Lincoln has offices in all major markets of the U.S. and throughout Europe. Lincoln’s cumulative development efforts have produced over 100 million square feet of commercial space and over 185,000 multifamily residential units. Lincoln Property Company is one of the largest commercial real estate companies in the world. Access www.lpc.com for more information. Phoenix Property Company (PPC) was formed in 1994 to focus on specific multifamily development opportunities. Since its inception, PPC and the affiliated GrandMarc have developed residential and mixed‐use communities with a construction cost of over $1 billion. These properties comprise over 6739 units and 240,835 sf of retail space. PPC develops in partnership with outside equity investors, many of which have chosen to invest in more than one project. Significant institutions such as AIG Global Real Estate, Behringer Harvard, Brookfield Real Estate Opportunity Fund and IBV Real Estate have chosen to invest in several PPC developments. Paragon Commercial Group is led by an institutional team of senior real estate executives focused on retail acquisition and development opportunities on the West Coast. With over 50 years of collective experience and a retail resume in excess of 10 million square feet of neighborhood and community centers, Paragon's deep market knowledge and extensive tenant relationships provide a constant pipeline of retail investment opportunities. Paragon enters into each development with the expectation of long‐term ownership and delivers only the highest quality retail product. This commitment to quality extends to each constituency involved in the development process including government agencies, lenders, property owners, tenants and partners. Whole Foods: A dynamic leader in the quality food business specializing in natural and organic foods and committed to sustainable agriculture and the strictest quality standards. Cinemark Theatres: The highest-attended motion picture company in the world, celebrating 30 years of providing their guests with superior customer service, engaging entertainment experiences, and lasting memories. CVS: The most prominent pharmacy health care provider in the United States, helping people on their path to better health by delivering expert care, convenience, and value. 800 Degrees: Honoring the heritage of Old World Italian tradition by offering Neapolitan pizza with many customization options in a contemporary setting. Urban Plates: A chef-driven restaurant serving fresh, farm-to-plate dishes that won’t break the bank. Chase Bank: A leader in consumer and commercial banking, serving millions of consumers and small businesses through bank branches, ATMs, credit cards, mortgage offices, and online and mobile banking. Starbucks: A global coffee company and coffeehouse chain committed to ethically sourcing and roasting the highest quality coffee in the world. 18/8 Fine Men’s Salons: Reinventing the barbershop, providing a wide range of services from haircuts, straight-razor shaves to waxing and facials. Wells Fargo: A trusted source for a wide range of financial products and services dedicated to building lifelong relationships one customer at a time. ROC Kitchen: A restaurant offering authentic family-style Chinese food in a relaxed, modern environment. Lyfe Kitchen: Quality modern American food using locally and sustainably sourced ingredients. Hopdoddy Burger Bar: Created to express the perfect union of burgers and beer, Hopdoddy’s passion is to bring you the freshest, all-natural ingredients including hormone/antibiotic-free black angus beef, from-scratch buns, and hand cut Kennebec fries. Sol Cocina: Not your ordinary Mexican restaurant, celebrating traditional Baja cuisine with a fresh, modern interpretation. Panini Café: A perfect blending of Old World-style favorites with a healthy and modern European flair. Varnish Lab: A premier nail salon destination showcasing the latest designs from over-the-top art and acrylics to basic mani/pedis. The Studio MDR: An intense, muscle quivering, shirt-drenching total-body workout studio melding elements of Pilates, cardio training and weight-bearing activity to create a revolutionary, one-of-a-kind exercise program. N’ice Cream: Organic gelato & sorbet made fresh daily and served in a bright storefront with morning coffee drinks. Runway at Playa Vista announced the addition of 8 new tenants to the growing list of retailers that have signed leases to join the new mixed-use lifestyle center in the heart of Playa Vista.